We love the completely classic combination of blue and white wherever it is! One of the best things about blues is that the shades mix oh so well. Blue and white is a favorite combination–especially by the water! A bold blue on a patio feels bright, fun and entertaining ready. If it’s the backsplash for a completely unique outdoor kitchen, all the better! But, of course, no one does blue and white quite like Mother Nature. Wherever you are today, wishing you blue and white skies–and, if you’re really, really lucky, blue water too! I’m in beautiful Litchfield Beach, SC today speaking at the Litchfield Books Moveable Feast Literary Luncheon–one of my favorite events–and then speaking to the Federation of South Carolina Women’s Clubs tonight. Tomorrow I’ll be in the Holy City, Charleston, SC, for a fabulous luncheon at High Cotton to help raise funds for the South Carolina Reading Partners, which promotes one of my favorite causes: literacy. If you’re in the area, join us! Happy weekend! And don’t forget to enter to win $250 to spend any way you want at Amazon. 25 copies of Slightly South of Simple, anyone? and Spring Break dangerously, wonderfully close, we can’t help but get a little touch of spring fever. What better place to visit (even if it’s only on our computers!) for a little spring dreaming than Naples, Florida. This gorgeous Naples vacation home is sophisticated and chic, the kind of place where you could live all year round, not just vacation. Is it any surprise that one of our favorite designers, Summer Thornton, designed this stunner? This color palette feels cozy and warm–and different from anything else we’re seeing right now. We love it! This piece is so perfect for those spaces where something with a back would feel too closed. Plus, it’s comfy extra seating! Each room is a little different from the last but the unifying themes in this home–like the color palette–makes it cohesive. Wood paneling gives a nod to the beach nearby. This canopy bed is so elegant. This bedroom feels like a getaway! This gallery wall proves that it’s completely possible to do coastal without getting kitschy. On vacation or just an ordinary day, this tub would feel like a vacation any time! Because bathroom storage is always at a premium, we’re loving how these baskets not only take advantage of extra space but also add texture. A settee at the end of a bed is so sweet. And there’s enough seating to have a party in this room! Florida should be fun! And this porch knows it. 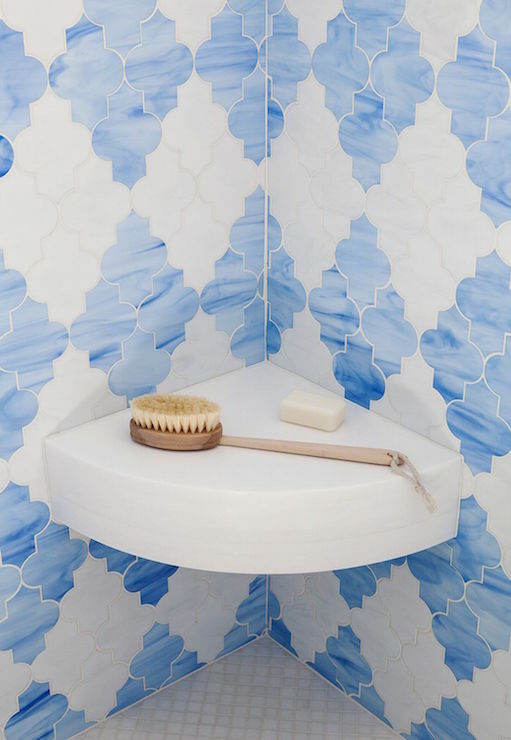 The blue and white tiles add a touch of whimsy. A pretty pool and lush landscaping lend a view worth coming back to. From the kitchen to the bedrooms to the patio, blue and white porcelain is a unifying theme of this beautiful Naples getaway. If this beautiful coastal getaway doesn’t have you Spring dreaming, we don’t know what would! Where’s your favorite spring vacation spot? Congratulations to Colette Darling, the winner of the $200 Framebridge Gift Card Giveaway! Stay tuned for our next fun giveaway. Looking to add the pinnacle of fresh, fun, timeless style to any room in your home? Blue paired with white? Perfection every time! It’s hard to believe but school is over in THREE DAYS! I am so excited I can hardly stand it. Because out-of-school-time means it’s beach time! I used to be the girl who changed bathing suits eleven times a day (that’s not an exaggeration) because she couldn’t stand the sand, so I’m not sure when exactly I started to love it so much. But, however it happened, all we know is that we’re ready for summer to start in earnest! While we are packing our bags and heading to North Carolina’s coast, Leigh Giles, fabulous designer and fellow Tarheel, will be packing her bags and leaving her Virginia home to head to one of our favorite spots in North Carolina’s mountains: Blowing Rock. While we’re baking in the sun, she’ll be nice and cool. We might have to go say hi to her when we need a break from the heat! And a helping heaping of the fine art that she enjoys employing so much. New York-educated and Atlanta-trained, Leigh’s classic designs caught our eye right off the bat. Blue and white never goes out of style, and a bookcase full feels welcoming and warm. Leigh also tackles the new and modern with particular skill, making spaces feel fresh, open and up to date. Unexpected touches–like lamps on the island!–set this designer’s work apart from the pack. You know we’re huge fans of twin beds in guest rooms. This one feels positively decadent. Full bedskirts and splurge-worthy linens create rooms that feel homey. These guests might want to stay a little too long! This room is perfect for coming home to after a long day. A small settee or loveseat at the end of a bed is one of our favorite touches. Black and white make a bold porch statement against a lush green backdrop. This pool house is the kind of place that could make us ditch our beach plans and stay home all summer long! Are you getting ready for summer? Do you have any fun plans? If you’ve followed us for a while, you know we are in complete awe of designers whose work really runs the gamut. Sure, picking a certain style and sticking with it has its charms, but we’re always amazed by those designers that can achieve a wide variety of looks for different homes–and homeowners.